Enter the dragon in Larian Studios/'/ incredibly deep RPG sequel. Divinity II - Ego Draconis Many years have passed since the darkness of Damian’s armies was repelled and he was banished from the world of Rivellon. While men enjoy their first years of real peace, Damian breaks free from his bonds and returns to take vengeance. And with hi.. The stage is shrouded in dry ice, spotlights gradually focus on the centre of the stage, the curtain rises and with the first move a fantastic show explodes around you: this is your first performance! You will be dancing with the world/'/s best. Select one of the 6 available characters, style your character using around 300 accessories and perform ..
TNT Racers features 18 action-packed courses, up to 4 simultaneous players (online or offline), and winning requires much more than just being the best driver. The decisive factor is being the best racer - you must collect the pickups and cleverly use the powerful weapons to catapult your opponents off the track!.. In Crazy Machines Elements players must create a chain reaction using different parts to accomplish tasks in their mission. Experience the latest chapter in the international, multi award-winning Crazy Machines series: “Elements”. This time with next gen visuals! Put your grey matter to the test by carrying out zany experiments. 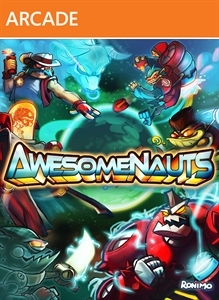 Build crazy mach..
Awesomenauts brings team-based competetive arena play to a platforming perspective. Play and customize several Awesomenauts as you storm the online battlegrounds and unlock loads of new abilities and characters for your arsenal. Coming May 2nd 2012 to Xbox LIVE Arcade and Playstation Network! [b]Official Site[/b]: [url]http://www.awesomenauts.co..
Own the road! In "Crash Time 5 - Undercover" you will experience non-stop racing action, and embark on a high-octane manhunt, with thrilling car chases and lots of explosive missions! Get ready for a dangerous undercover operation and smash the criminal smuggling ring. Use a variety of fast cars and armored vehicles, equip them with a sel..